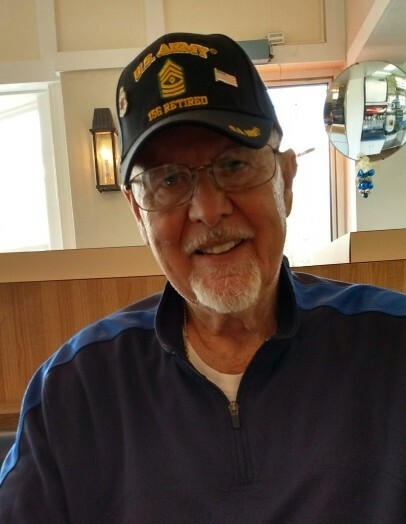 Rudolph Richard Yutzy, 76, of Fayetteville was welcomed into the loving arms of his Lord and Savior on Monday, January 14, 2019. He was born in Hanau, Germany. At the age of 12, he took a boat with his family to America where he received his citizenship. Richard later enlisted in the Army serving 22 years, earning the rank of First Sergeant. After retirement from the Army, he continued working with the military as a civilian at Womack Army Hospital for another 20 years. Richard was a devoted Christian, an active member of Fayetteville Community Church, Band of Brothers, the Balm in Gilead Ministries and Rainbow Ministries. He lived his life with a servant’s heart for others and always brought glory to God for all things that are good. Always Encouraging others around him, visiting and praying for those who were sick. Anytime there was a need or want he made it his mission to provide it. It never failed through the provision of God....he provided for others (whether they wanted it or not). He loved his family and left to cherish his precious memories are his wife, Janice Lynn Yutzy of the home; daughter, Heidi Lynn Parker of Atlanta, Ga.; two brothers, Scott Yutzy and Robert Yutzy, both of Springs, Pa.; two sisters, Trudy Hutzel (Bill) of Salisbury, Pa. and Heidi M. Rounds (Rodney) of Cumberland, Md. ; his mother-in-law, Dorothy Stanfill of Winter Haven, Fla.; sisters-in-law, Sheril Tatum (Michael) of Lakeland, Fla. and Donna Matlock (Kelly) of Winter Haven, Fla.; a granddaughter, Brittany Buss (Myles) of Killeen, TX; and great grandson, Matthew Buss. Richard was our go-to man, so dependable, our precious Git-r- done man! A funeral service with full military honors will be held at 11 am Friday, January 18, 2019 in Fayetteville Community Church with burial to follow in Cumberland Memorial Gardens Cemetery. The family will receive friends from 9:45 am to 10:45 am at the church prior to the service. In lieu of flowers, donations may be made to Fayetteville Community Church 2010 Middle River Loop Rd. Fayetteville, NC 28312 or Balm in Gilead Ministry 3110 Doc Bennett Rd. Fayetteville, NC 28306.